Heat oil in medium skillet. When the oil is hot, fry tortillas until crispy. Stir in onion, pepper, and garlic and let cook until vegetables are almost tender. Add cheese and milk. Cook until the cheese is melted but tortillas are still crisp. Meanwhile in a different skillet cook eggs according to your preference (fried, scrambled, etc.). 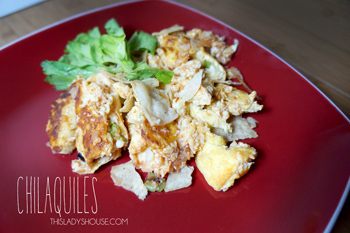 Serve eggs over tortilla and cheese mixture. Garnish with salsa, lime, and sour cream.